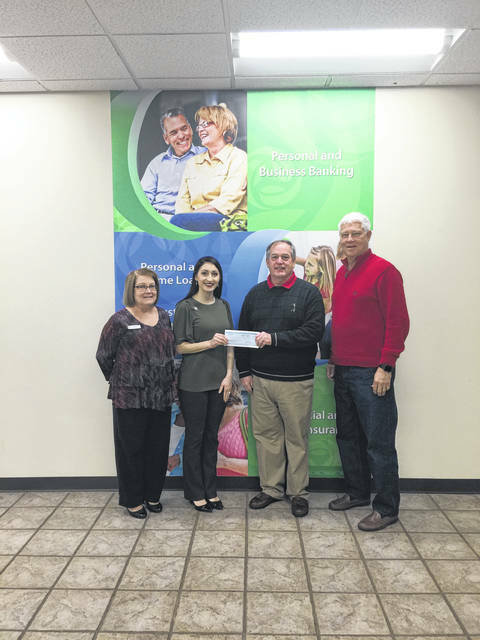 Roxanne Weaver and Valerie Johnson present the Peoples Bank donation towards the Gold Star Mothers Monument to Ed Cromley and Rick Handley. 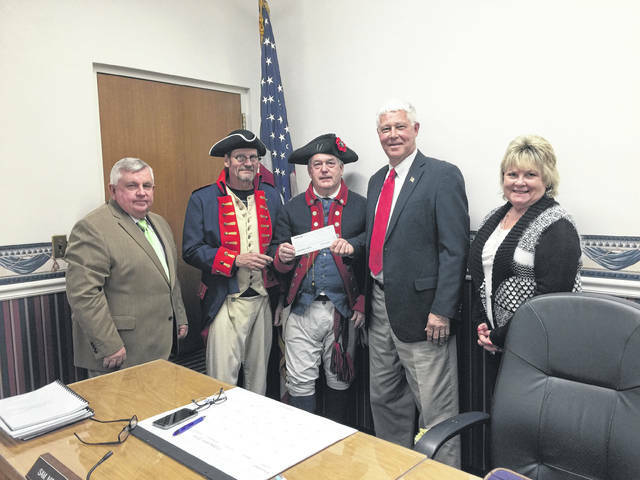 Members of the Colonel Charles Lewis Chapter of the DAR recently donated towards the Gold Star Mothers Monument presenting their check to the Mason County Commission. 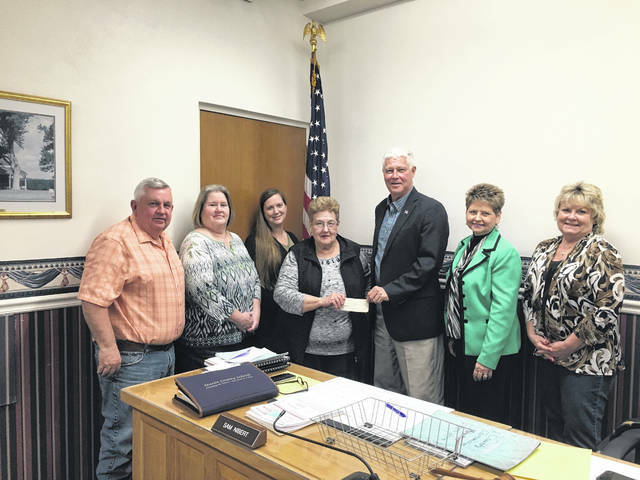 Those pictured from left tare Commissioner Sam Nibert, Debby Hickel, Cary Supple, Darlene Haer, Commission President Rick Handley, County Clerk Diana Cromley, and Commissioner Tracy Doolittle. The Point Pleasant Chapter SAR presented their donation for the Gold Star Mothers Monument to the Mason County Commission. 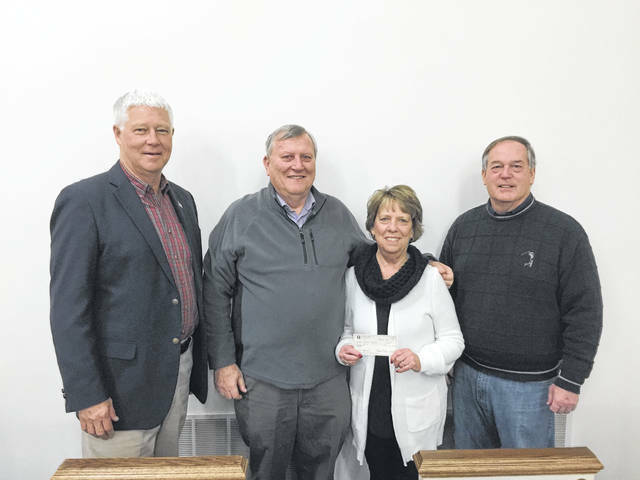 Those pictured from left are Commissioner Sam Nibert, David Siders, Ed Cromley, Commission President Rick Handley, and Commissioner Tracy Doolittle. 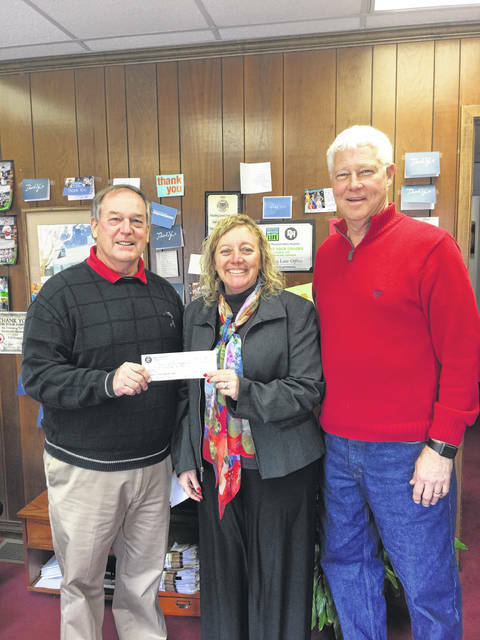 Ed Cromley is pictured receiving a donation for the Gold Star Mothers Monument from Tanya and Rick Handley. Dennis and Barbara Brumfield, center, presenting their donation to the Gold Star Mothers Monument to Rick Handley and Ed Cromley. POINT PLEASANT — On West Virginia Day, a new historical monument will be presented to the residents of the city. Ed Cromley, president of the Point Pleasant Chapter of the SAR/Memorial Committee member, shared The West Virginia Society of the Daughters of the American Revolution has chosen Point Pleasant as the site of the Gold Star Mothers Memorial, which will be a memorial in honor of mothers who have lost a son or daughter while serving in the armed forces from the Revolutionary War to present day. Cromley shared the Mason County Commission has donated land in front of the Mason County Public Library, an area considered to be prominent and secure by the Memorial Committee members for this monument. The Gold Star Mothers Memorial will be facing the Mason County Courthouse and will be visible from every direction coming into the city. Construction of the monument, which Frank Beckner is contracted to build, will begin when the weather improves and a dedication ceremony will be held on Thursday, June 20 at 3 p.m.
Debi M. Smith, state vice regent of the West Virginia State Society NSDAR, added Jamie Lester has been commissioned by the West Virginia DAR to sculpt a large bronze memorial plaque depicting a Gold Star Mother holding the U.S. Flag close to her chest along with a written memorial. The Gold Star Mothers organization, DAR, SAR, contributors, and the public will be invited to attend this event and a full color guard will be present. The Memorial Committee is working to raise $6,000 to help with funding for this project. Cromley commented roughly $4,000 has been donated so far and the members are still waiting on other pledges and interested groups’ checks. Any donation given that is $500 or more, the donor(s) will have their name(s) engraved in a plaque that will be placed on the backside of the memorial, facing the entrance to the library. Smith shared The Gold Star Mothers is an organization originally formed in 1928 for the mothers who had lost a son or daughter while in service of the U.S. Armed Forces in World War I, but today has grown to now recognize all mothers from all U.S. wars. West Virginia soldiers have fought in every war beginning with the Revolutionary War, including present times, in which creating a large number of mothers in West Virginia to be honored. The Gold Star Monument project was inspired by West Virginia State Regent Malinda Davis as her “State Regents Project” during her administration from 2016-19. Erin Perkins contributed to this article. https://www.mydailyregister.com/wp-content/uploads/sites/24/2019/03/web1_GSM2-1-1-1.jpgRoxanne Weaver and Valerie Johnson present the Peoples Bank donation towards the Gold Star Mothers Monument to Ed Cromley and Rick Handley.